LA JOLLA–(August 29, 2018) Every smell, from a rose to a smoky fire to a pungent fish, is composed of a mixture of odorant molecules that bind to protein receptors inside your nose. But scientists have struggled to understand exactly what makes each combination of odorant molecules smell the way it does or predict from its structure whether a molecule is pleasant, noxious or has no smell at all. Now, scientists from the Salk Institute and Arizona State University have discovered a new way to organize odor molecules based on how often they occur together in nature, which is the setting in which our sense of smell evolved. They were then able to map this data to discover regions of odor combinations humans find most pleasurable. The findings, published on August 29 in the journal Science Advances, open new avenues for engineering smells and tastes. "We can arrange sound by high frequency and low frequency; vision by a spectrum of wavelengths and colors," says Tatyana Sharpee, an associate professor in Salk's Computational Neurobiology Laboratory and lead author of the new work. "But when it comes to olfaction, it's been an unsolved problem whether there is a way to organize odors." Previously, scientists had tried to classify odorant molecules strictly based on their chemical structures. "But it turns out molecules with structures that look very similar can smell very different," says Sharpee. Using existing data on the odorant molecules found in different samples of strawberries, tomatoes, blueberries and mouse urine, they used statistical methods to put odorant molecules on a map based on how frequently they occurred together in the four sets of samples. Those molecules that occurred together more frequently were placed closer to each other. "It's akin to me telling you that Chicago is x number of miles from New York, Los Angeles and Melbourne. And if you mapped the cities, you'd find out is that the Earth's surface is curved, not flat–otherwise the distance from, say, Melbourne to Los Angeles wouldn't add up. We did the same thing for odor," explains Sharpee. Using this strategy, the scientists found that odor molecules could similarly be mapped onto a curved surface in three dimensions. But instead of a sphere, like Earth, it turned out to be the shape of a Pringles potato chip–a shape mathematicians call a hyperboloid. When the team looked at how the molecules clustered on this surface, they found there were pleasant and unpleasant directions, as well as directions that correlated with acidity or how easily odors evaporate from surfaces. These observations now make it easier to construct pleasant odor mixtures to use, for example, in artificial environments (such as a space station). "By revealing more about how odorant molecules and the brain interact, this work may also have implications for understanding why people with some diseases–like Parkinson's–lose their sense of smell," adds behavioral neuroscientist Brian Smith of Arizona State University, a coauthor of the paper. In addition to Sharpee and Smith, Yuansheng Zhou, of the Salk Institute, was also an author of the new paper. The work and the researchers involved were supported by grants from the Aileen Andrew Foundation and the National Science Foundation. 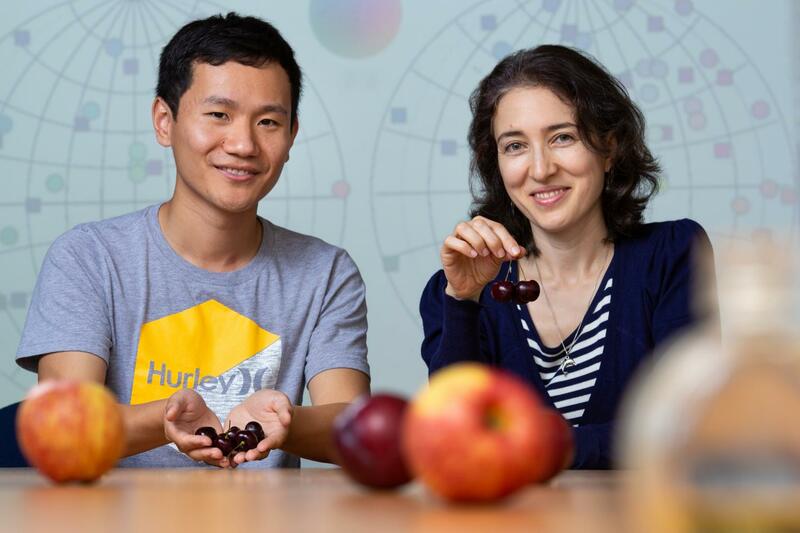 Two collaborative grants to Sharpee and Smith originated as part of the new IDEAS Lab project at the National Science Foundation called "Cracking the Olfactory Code."